17-Nov-2001 -- NW of Moulamein, NSW. This was the first stop on a planned hunt for five confluence points in one day taking in three new confluences in the Murray/Riverina area of southern New South Wales (35°S 144°E, 35°S 145°E and 35°S 146°E) and two previously visited confluences (36°S 146°E and 37°S 146°E) which are more-or-less on the way back home to Melbourne. The trip started on Friday, 16 November 2001 with a four hour drive after work in the evening to a small town called Barham, which is just over the Victoria/NSW border on the Murray River. Barham is about 70 km from Moulamein (where the confluence trip begins in earnest) but my preliminary planning for the trip indicated that the motels in Barham were a little bit better value for money. We got up quite early on Saturday morning, scoffed down some breakfast and hit the road for what was sure to be a long day ahead. After a pleasant drive through generic farmland, we arrived at Moulamein at about 7:30 am. I had done quite a bit of planning for this trip, including the procurement of 1:250,000 topographical maps and 1:50,000 aerial photos – plus a few sneak peeks at the 1:25,000 maps at Information Victoria to make sure that my planned confluence visits were all feasible. I had also just upgraded my GPS and digital camera, so hopefully the photos are a bit better for this trip than my previous confluence visits. We headed north-west out of Moulamein on a sealed road to the west of the lake and then shortly after the road became unsealed, turned left towards the local airstrip. This dirt road got us to within about 800 metres of the confluence – which was a little bit too far for the kids to walk cross-country, so I did this one solo. 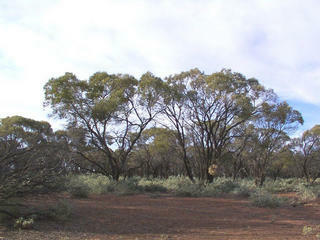 The confluence is located in some lightly treed grazing land, although there was no sign of any livestock. There were quite a few motorcycle tracks and donuts – possibly from recreational use. The confluence point itself is in a small treed area. The walk was nice and easy with no hills or serious obstacles. So, one down and four to go – on to 35°S 145°E.